The Barkol Basin (BB) is an intramontane basin in the easternmost Tian Shan, Northwest China. 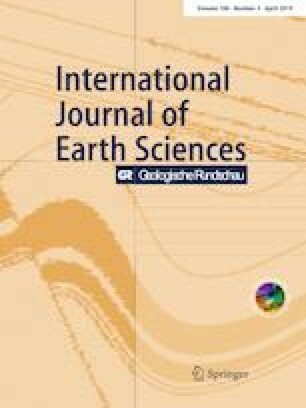 We reconstructed the tectonic evolution of the BB based on an investigation of its stratigraphy and faults, and we differentiated the basin infill into Quaternary sediments and the Oligocene–Miocene Taoshuyuanzi Formation by combining field observations and geophysical data with borehole data. We used detrital zircon U–Pb dating and palaeo-currents to decipher the provenance of the lower Jurassic Badaowan Formation, which contains the only Mesozoic sediments throughout the easternmost Tian Shan. The results demonstrate that the BB and Harlik Range constitute the main sources. Furthermore, we found that the Taoshuyuanzi Formation unconformably overlies the Palaeozoic basement in the basin, indicating that the BB formed during the Oligocene–Miocene. Based on Magnetotelluric (MT) and seismic profiles, this formation was deposited under the control of basin-bounded faults. According to the field investigation, the boundary faults of the basin were recognized as sinistral strike-slip normal faults. Additionally, remote sensing and electron spin resonance (ESR) data provided valuable information on the Quaternary proluvial fan divisions, which suggest a multi-stage tectonic evolution of the basin during the Quaternary. The Mesozoic–Cenozoic basin evolution in the easternmost Tian Shan was divided into four phases based on an integrated analysis of the stratigraphy and structures of the Santanghu Basin and the Turpan-Hami Basin: (1) from the Late Triassic to the Early-Middle Jurassic, tectonic subsidence dominated the Santanghu Basin and Turpan-Hami Basin; (2) during the Late Jurassic-Eocene, the episodic uplift of the Tian Shan Mountains constricted the Turpan-Hami Basin and the Santanghu Basin; (3) during the Oligocene–Miocene, the BB formed as a subsidence basin controlled by sinistral strike-slip normal faults, and the basins filled with thick layers of clastic rocks; and (4) during the Pliocene–Quaternary, the eastern BB uplifted, and the basins deformed. In conjunction with previous research, the dynamic background of the formation of the BB was presumably related to the clockwise rotation of the Tarim Block to the south and the strong left-lateral movement of the Gobi-Tian Shan fault system. The online version of this article ( https://doi.org/10.1007/s00531-019-01704-y) contains supplementary material, which is available to authorized users. This work was supported by the China Geological Survey (Grant Nos. DD20179607, DD20160060). We acknowledge the editor in chief (Prof. Albrecht von Quadt), the reviewer (Dr. Zeng Yun-chuan) and three anonymous reviewers for their detailed and constructive comments that have resulted in significant improvements in the paper. We are grateful to Zhang Pan, Zhao Xuan from China University of Geosciences (Wuhan) for their assistance in the field work and thank Research Institute of Tu-Ha Oilfield Company for providing the high-quality seismic data.